I love soup, particularly when the cooler weather comes calling. From early fall though late spring, it seems like I've always got some kind of soup simmering on the stove or tucked away in the refrigerator for a quick meal. Much of the time, soup is a spur-of-the moment creation, based on what leftovers are available and what vegetables aren't reserved for other uses. It's not that often that I make deliberate soup, where I start with a recipe and end up with exactly what I had planned. Nope. Most soups here are pretty haphazard. 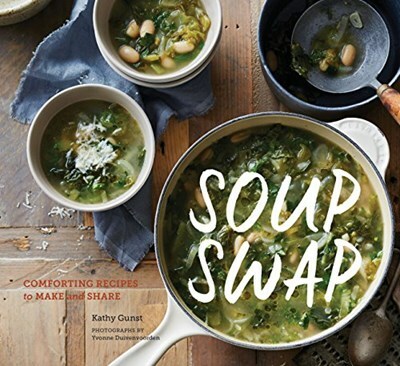 Which is why I was interested in the book Soup Swap by Kathy Gunst. With book in hand, I could shop for ingredients and make purposeful soups. The one I chose for the online book tour I'm participating in was an asparagus and leek soup. It intrigued me. I love potato leek soup, and I adore asparagus. It seemed like the perfect transitional soup, with asparagus still very available while the weather was just starting to turn cooler. This recipe uses asparagus in three different ways. And then, to add some richness, it's served with a poached egg on top. I'll admit that I didn't make this recipe exactly as written. I didn't weigh the asparagus, for example. And I used fried egg rather than the poached egg that was called for. I think fried eggs are easier, and it was my dinner, so I was fine with that. This was a lovely light soup that is also rich because of the addition of the egg. Quite tasty. And although the instructions seem long, it's pretty simple. Now that I've made it once, I could make it again with barely a glance at the instructions. Or just wing it. Cut the tips off the asparagus and set aside. Snap the stalks where they naturally break, or cut off the tough ends. Put the tough ends in a saucepan and set the tender part aside. Cut off the tough green part of the leek and chop it roughly. Rinse off any dirt or grit. Put the dark green parts of the leek in the saucepan with the tough asparagus ends. Add the vegetable stock and bring to a boil, then lower to a simmer. Cover the pan and cook for 15 minutes. Halve the tender remaining leek lengthwise - this should be just the tender pale green section and the white. Rinse it under cold water to get rid of any dirt or grit. Slice the leek crosswise into thin pieces. Cut the middle part of the asparagus into pieces about an inch long. Put 1 tablespoon of the olive oil in a stockpot over medium heat. Add the tender leek slices and the chives along with salt and pepper. Cook, stirring, for about 5 minutes. Add the asparagus pieces (those middle parts you cut; not the tips) and cook for another 5 minutes. Turn the heat to high, add the wine, and bring to a boil. Strain the stock from the saucepan into the stockpot. Discard the tough leek pieces and asparagus ends and bring to a boil, then turn the heat to low. Cover the pot and cook for 30 minutes. Remove the pot from the heat and let it cool for 5 minutes before blending it in batches in a blender. You could also use a stick blender or food processor. Blend until you have a smooth puree, then return the soup to the pot. Heat the remaining 1/2 tablespoon (1 1/2 teaspoons) of olive oil in a skillet. Add the scallions and cook for 4 minutes, or until they are golden brown. Add the asparagus tips and lemon zest. Season with salt and pepper. Cook, stirring, for about 5 minutes, or until the asparagus tips are almost tender. Poach or fry one egg per serving of soup. Ladle the soup into bowls, top with the egg, and garnish with some of the asparagus tips and scallions. Serve hot. As part of the book tour, I received a copy of the book, a Chef's Choice Pronto Pro Diamond Hone knife sharpener, a Zeroll ladle , and a Zeroll slotted spoon .